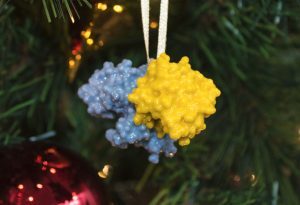 3D print-out of the structure of beta-galactosidase, an enzyme that catalyses the hydrolysis of lactose into galactose and glucose. Beta-galactosidase is one of the biggest occupants of EMPIAR: EMBL-EBI's resource for raw, 2D structural data. 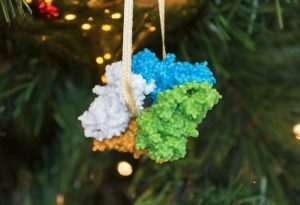 Ewan Birney celebrates 20 years of the Protein Data Bank in Europe by paying homage to nine of its most intriguing tenants in his “Structures of Christmas” series of blog posts. Nowadays, we can see the position of atoms as if we had vision millions of times sharper than human eyes allow. 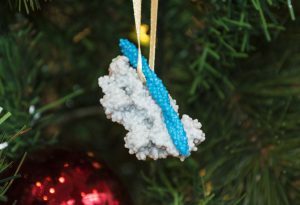 This is the gift of structural biology – the science of figuring out the three-dimensional structures of molecules (usually proteins), and correlating their shape to their function. Such insights give us clues about how changing a molecule’s shape could change what it does. That’s essentially how medicines work. Determining the shapes of molecules is painstaking work, so sharing that knowledge openly with scientists around the world is essential for publicly funded research to proceed efficiently. EMBL-EBI is at the heart of open data in the life sciences, and hosts the European arm of the world’s longest-running molecular data resource: the Protein Data Bank (PDB). Launched in 1971, the PDB is now a worldwide collaboration (wwPDB) hosting databases in the US, Japan and Europe. Each of these data resources inspires innovation and promotes understanding of the fundamental processes of life. As the Protein Data Bank in Europe (PDBe) looks back on its 20th year in operation – and celebrates its annotation of the PDB’s 25,000th structure today – Ewan Birney pays homage to some of its most intriguing tenants. If there is one protein structure we can say we know inside and out, it is the humble lysozyme, which we carry in our tears. It was the first enzyme structure to be solved via X-ray diffraction. A protein that lets us see light: Opsin. In humans, opsin is in an internal cell membrane, arranged almost like a stack of pancakes with these proteins poised for photons to hit them. When a photon does hit, the helices rotate relative to each other, changing the shape of the “inside” of the protein. 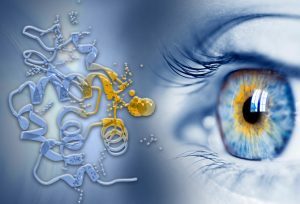 Other proteins sense this change and ultimately trigger the photoreceptor cell to send an electric signal to our neurons. This happens thousand of times per second across thousands of cells, and indeed is happening now as you read this. A machine that makes machines: The Ribosome. Quite a lot of a cell’s energy is spent on manufacturing proteins, using one of the largest, most complex bits of machinery we have: the ribosome. 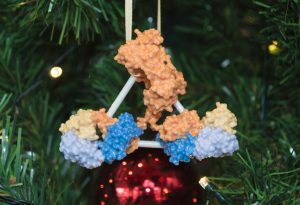 The ribosome works a bit like a knitting machine, taking in long strands of nucleotides and translating them into bespoke proteins. An inefficient molecule that led to the evolution of plants: RuBisCO. If a Martian visited Earth and was asked to report back on the most important ingredient in our biosphere, quite possibly it would choose RuBisCO. As enzymes go it isn’t very big, but it is a very big deal. 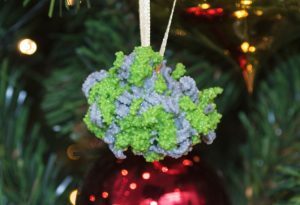 It is extremely common – every single plant and photosynthetic cyanobacterium is stuffed full of it – and it performs one of the most crucial reactions for all of life: “fixing” gaseous carbon dioxide into sugars and amino acids. But why is it so inefficient? An entity that causes a hideous disease in cattle: Foot-and-mouth-disease virus. The foot-and-mouth-disease virus is a large RNA virus that causes a horrible, highly infectious disease in cattle. 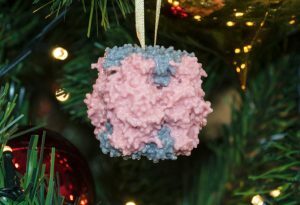 It has a capsid (made of protein) that contains a single strand of RNA and binds to a receptor site on the membrane of a host cell, kind of like using a magnetic ID card to open a door. 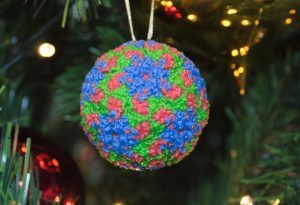 Once it’s inside, the capsid dissolves and the RNA goes through the cell’s ribosomes to get translated into more viral proteins. 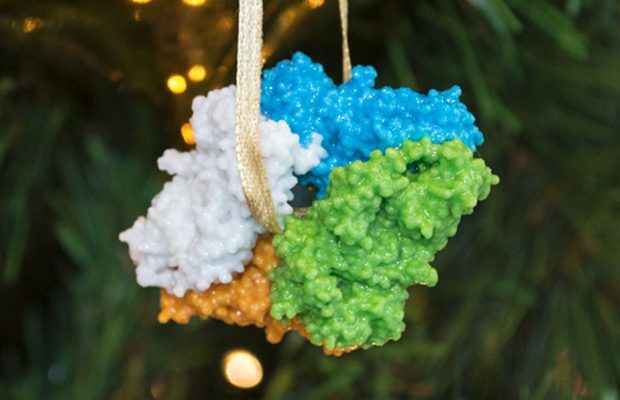 The kicker is that some of these proteins block the synthesis of normal cell proteins. So the cell is completely taken over – good for nothing else but making virus until it bursts. It’s a nasty little thing. A killer of human gut cells that tricks a human protein into helping it: Cholera. Every parasite that aims to invade or usurp another living cell needs to get an unwilling partner to do its dirty work somehow. The parasitic Vibrio cholerae bacterium, which kills human gut cells, does this very well. Its henchman is the so-called ‘CTA1 subunit’ of the cholera toxin, a bacteriophage (effectively, a parasite on a parasite), and its dupe is the human signalling protein ARF6. The three fit together almost perfectly, as you can see. Picture the antibody as a strong Y-shape: two arms reaching up, each hand a barrel with long, fat fingers. The barrels (beta sheets) are constant – but the fingers upon them get deliberately scrambled. They are different for each, individual antibody. Antibodies are the only known case in vertebrates that involve purposeful editing of our own genome. The product of this editing is a mind-boggling diversity of possible fingers and hand arrangements, with each finger able to bind to a different foreign agent – often, but not always, a protein. In muscle, actin is laid out in a regular series of contraction units, repeated in order. Myosin hauls itself against the actin and catches it, pulling forwards (consuming energy). It then brings in another myosin, which hauls itself against another actin. By this ‘strike and pull’ action, each of the tiny contraction units shrink, and the cumulative effect is physical changes in muscle length. This powers every kind of muscle movement, from the beat of a butterfly’s wing beat to each step of Usain Bolt’s 100-metre sprint. Beta-galactosidase: a fairly run-of-the-mill protein that cleaves sugars. What makes this molecule so special is that is was determined at very high resolution (~2.2 Ångströms) using cryo-Elecrton Microscopy – a fairly new technique. Cryo-EM gives us a highly detailed view of molecules that do not stand up to crystallography, and so opens up a new world of molecules to explore. Beta-galactosidase is one of the biggest occupants of EMPIAR: EMBL-EBI’s resource for raw, 2D structural data. 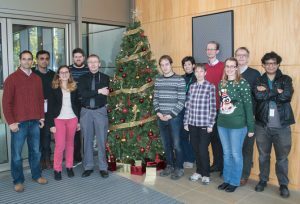 Thanks to the curators in our Protein Data Bank in Europe team who helped us create eight 3D structures as ornaments on the EMBL-EBI Christmas tree! 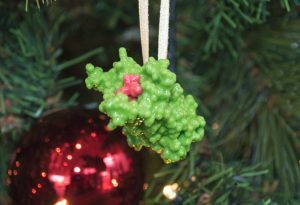 Lysozyme was too fiddly to print, but the rest worked out beautifully. Special thanks to Matthew Conroy and Alice Clark for their help. Pictured from left to right: Eduardo Sanz-Garcia, Abhik Mukhopadhyay, Typhaine Paysan-Lafosse, David Armstrong, Matthew Conroy, John Berrisford, Sanja Abbott, Lora Mak, Andrii Iudin, Alice Clark, Oliver Smart and Carlos Lugo.